When I was a child, I loved playing with Play-Doh. I could spend hours sculpting those colorful blobs into various things, and I would never get bored. Now that I’m an adult, I don’t play play-doh anymore, but I’m glad to find that the classic toy has also embraced the digital platform. Enter PLAY-DOH Create ABCs, an educational iPad app from Hasbro and PlayDate Digital, that teaches kids to recognize letters, write, and have fun with colorful Play-Doh creations. When you start the app, you are asked to create up to three user profiles. You can also watch a short intro video (or skip it if you want). Then, you choose between three play modes: Write and Craft, Create and Share, and Letter Matching. In Write and Craft, you learn to trace uppercase or lowercase letters of the alphabet by following lines of Play-Doh blobs. 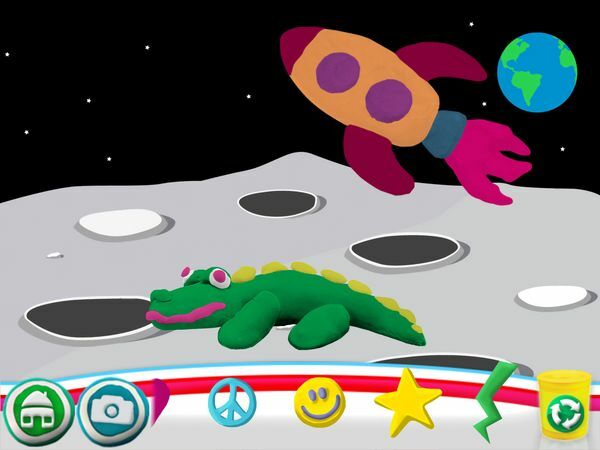 Once you finish a letter, the app will show you a short animated clip featuring an object that begins with that letter, for example A is for Alligator, R is for Rocket, S is for Sun, and so on. The app also asks if you want to recreate the object. If you choose to recreate the object, the app will reveal a new screen that contains a transparent pattern. Your task is to drag the corresponding pieces from the bottom of the screen to their respective places in the template. You can also choose the color of Play-Doh to use for each piece. Once your creation’s done, you can either “Squish It” or “Save It”. If you choose to squish, you can drag your finger along the screen in downward motion and watch your object gradually flattens. In Create and Share, you can design your own Play-Doh scenes. First you choose from the eight included backgrounds, such as outer space, under the sea, or the bedroom. Then you choose any of the pieces that you made in Write and Craft, and drag it to the screen. The app also includes several pre-made shapes, like hearts and letters, for variety. Just like in most sticker books, you can move the objects on screen by dragging. You can also rotate and resize them using two-finger gestures. Once you’re happy with your scene, you can tap on the Camera button to save the image to Camera Roll. Finally, in Letter Matching mode you engage in a quiz to test your knowledge of the alphabet. The app will show you a letter alongside three different objects. Your task is to find which of those three objects corresponds to the letter. If you need assistance, you can tap on each object to hear its name spoken aloud. Each section of PLAY-DOH Create ABCs comes with an instructional video at the beginning. The app also includes verbal assistance to assist your kids as they play. For instance, if they traced a line incorrectly in Write and Craft, the app will encourage them to try again. There is also a Parents Section, in which parents or teachers can monitor their juniors’ progress in the app. The app provides separate reports for each player profile, so you can learn which areas each child needs help with. For child-safety, the Parents Section is protected with a password. To open this section, you first need to a valid birth year. It is notable that the app won’t accept any year after 1995. PLAY-DOH Create ABCs is a nice app that lets kids create and play but without the physical mess. I like that the app has three unique play modes to spice up the learning process. Each mode is also quite nicely done. I really like that in Write and Craft, juniors get to learn how to trace letters and then make objects that are associated with that letter. I think the “Squish It” feature is cute, and it really reflects the playful nature of Play-Doh. I do wish is that instead of simply reconstructing pre-made pieces, kids can freely create their own objects. After all, when I hear the word Play-Doh the one thing I instantly think of is being able to create any sculpture from scratch. That being said, overall the app will do if you’re looking to teach your kids about the alphabet in a fun way. PLAY-DOH Create ABCs is an entertaining app that blends digital learning with a classic toy. The three play modes offered give the app enough depth and variety, and overall it is a fun way to learn the alphabet. If your juniors are between between 3 to 5 years old, then this app should be a perfect fit. Get PLAY-DOH Create ABCs on the App Store.